Religion is changing—from the stained glass industry to Portlandia's perfect parody of a desperate pastor's plea that "church is an option." At the same time, there's been a major renaissance in religious architecture over the last few years. "The landscape of sacred space is changing, along with dramatic shifts in organized religion," explains Michael J. Crosbie, the editor of Faith & Form magazine, which focuses on religion, art and architecture. Crosbie is also the organizer of the magazine's annual awards, which honor religious architecture around the world. "Jury members agreed that religious art and architecture are flourishing throughout the world, and that artists, architects, liturgical designers, students, and others are exploring ways to balance tradition with new demands of religious practice," he explains of this year's crop of winners. The most recent winners of the awards reflect the changing landscape of religion: They range from a "chapel" that can host any type of congregation, to a hyper-modern mosque, to a super-sustainable retirement home for elderly nuns. Take a look at a few highlights below. This school and prayer space built for underprivileged kids in Thailand, near the border of Myanmar, isn't actually "floating." But it is designed to look like it—it was based on a child's drawing of the future building, which showed it flying through the sky. Japanese architect Kikuma Watanabe created the next best thing: A series of foundational walls made from sand bags that open up into a "floating" grass and bamboo roof, where the prayer space is located. So while it's not levitating, the prayer space definitely feels like it's humming above the rest of the building's activities. Though we don't think of it as a very religious university anymore, Georgetown is a Jesuit school—and Jesuit traditions, like contemplative "retreats," are fairly big part of its mission. 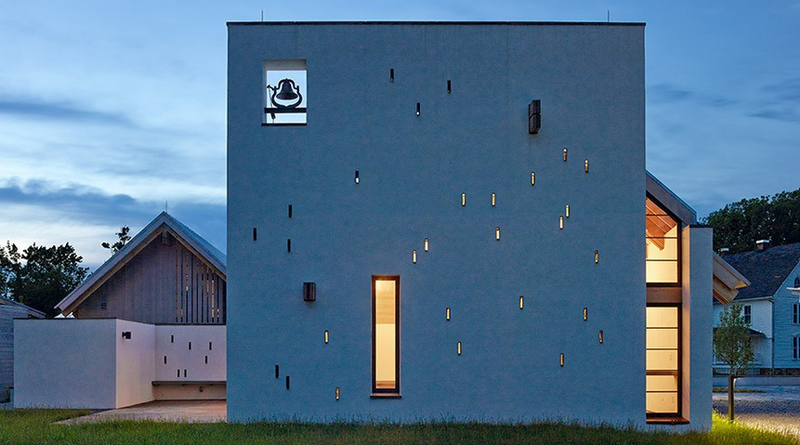 This chapel by Dynerman Architects is the centerpiece of a new campus development in rural Virginia, designed for events held by Muslim, Catholic, Hindu, and other religious groups on retreats at Georgetown. The super simple design was, as the architects explain, an attempt at "an architecture that imparts a strong and clear spirituality without specific reference to any one religion." In other words, yes, the cross can be removed. This building in Toronto isn't exactly a convent—it's more like a place for nuns, who have worked for most of their adult lives for others, to "retire." According to the Toronto Star, they range from 75 to 98 years old, and many are ailing and need consistent medical care. The building is a secluded piece of nature in the city, designed by Shim-Sutcliffe Architects with everything from rain collection to a green roof—apparently, that was important to the convent. "In the last 12 years, the sisters have become more aware of the harm done to the planet and they wanted to do their part in sustaining it," said Congregational Leader Thérèse Meunier in a statement on its website. Lincoln Square Synagogue, on Manhattan's Upper West Side, used to occupy a historic piece of architecture in New York—a curving travertine building that seems like a counterpoint to nearby Lincoln Center. But congregations grow—so they built the largest new synagogue NYC has seen in half a century. Designed by CetraRuddy Architecture, the new space looks like a glowing organism sandwiched between two somber Manhattan office buildings. Because this community mosque in Riyadh floats three feet higher than the rest of the development around it, visitors have to climb a few stairs before entering. HOK devised a "moat" of granite steps that seem to float in front of the facade, which is cloaked in layers of traditional Islamic patterns. Though the geometry is hyper-modern, the building still retains most of the traditional rules that govern mosque design—it's an interesting mix of avant-garde ornamentation and traditional design.